The Book of Common Prayer Book mandates a Homily or Sermon at every Mass. Catholic Christianity emphasizes completeness through Word and Sacrament – Sacrament and Word. The distinction between a Homily and a Sermon is, at best, blurred. 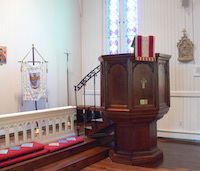 A Homily is sometimes considered extemporaneous…a frequent practice at weekday masses. Whether Homily or Sermon, both teach and reinforce why the Parish comes together each week. Printed copies of the Sermon are provided for persons desiring them. Sermons at Saint Joseph Parish are free of partisan politics…religious or secular. The Parish standard of teaching is exemplified at Mass through both Liturgy and preaching. The Epistle and Gospel reinforce why we are here and make us want to hear more about the Good News. Sermons are life-focused and hope driven and ultimately leads back to what defines Saint Joseph Parish…Lex Orandi, Lex Credendi, Lex Vivendi…We Pray, We Believe, We Live.